International Day of Yoga was celebrated with enthusiasm in KIIT and Kalinga Institute of Social Sciences (KISS) at KIIT Cricket Stadium on June 21, 2017. 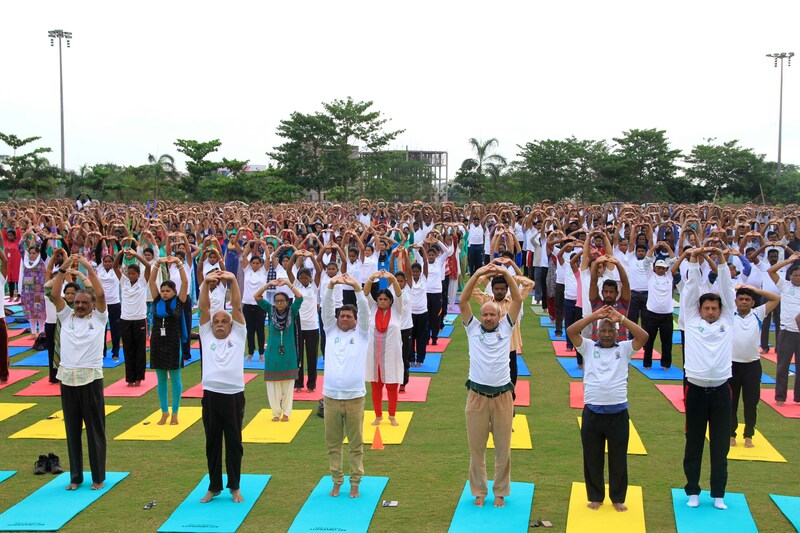 Led by Prof. Achyuta Samanta, Founder, KIIT & KISS, thousands of staff, students and teachers performed various basic Yoga postures during the hour-long session. Inaugurating the programme, Prof. Samanta said, “Yoga is the only way to free our body and mind from various illnesses. It is a journey through the inner self to connect to the supreme soul. Yoga and meditation are beneficial for every human being as it relaxes mind and body”. Even though the world has been observing International Day of Yoga only for last few years, Prof. Samanta has been propagating this ancient Indian technique to keep mind and body fit among the students of KIIT and KISS for last 12 years, said Prof. Sudarshan Nanda, Professor of Eminence and Research Chair, KIIT University. In 2014, the United Nations has declared June 21 as the International Day of Yoga for the first time. As many as 192 countries participated in the celebration. It is a matter of pride for all Indians that yoga which is part of Indian culture is now getting such attention on an international platform. Later, some difficult yoga asanas were demonstrated by two students of KISS. Dr. Gaganendu Dash, Director-Sports, KIIT proposed vote of thanks.